Most Cypress trees are found in the Southern US States and the South Atlantic States. It grows in swamps and has a conical base, with roots that seem to stand out in the water. Cypress is naturally resistant to deterioration from UV sunlight, insects and moisture. Like many other trees, the heartwood of old-growth Cypress has the highest resistance to rot with second-growth trees having moderate resistance. Unfortunately, old-growth lumber is no longer readily available, but second-growth is readily available. The sapwood is narrow and almost white in color while the heartwood ranges from light yellow brown to a dark chocolate brown. The Cypress we use is the inland type better known as Yellow-Cypress. It has a nice straight even grain pattern with almost no knots or resin. We buy our Cypress rough cut so we can use full inch thick boards for our chair and table slat boards. The overall appearance of a finished Cypress chair is quite beautiful with the uniform color and grain pattern. The finish is very nice as it works and sands easily. It can be stained easily or left unfinished to turn a silver gray. The cost is about the same as White Oak lumber, but it is much easier to work with. It takes stains and clear finishes well yet it can be left unfinished to turn a silver gray. The thickness of the lumber we are able to use is a major plus and the weight of the furniture is manageable without being to light. Ipe (ee-pay), Brazilian Walnut or Ironwood is native to just about every Latin American country except Chile. There are about 20 different species of the tree that grows on ridge tops, riverbanks and marsh forests. The tree reaches heights of 100 to 150 feet with trunk diameters of 2 to 6 feet. Ipe wood is prized for its durability, its strength, its natural resistance to decay in wet conditions and insect infestation. This remarkable wood was used on the famous Atlantic City boardwalk. It took the force of hurricane Sandy to destroy it. 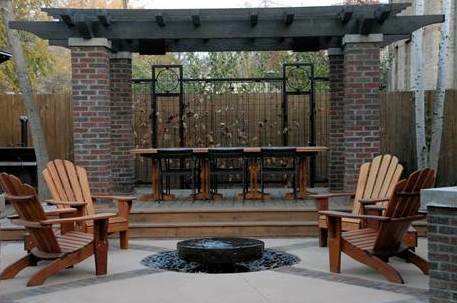 Ipe certainly earns the name "Ironwood" as it has a class "A1" fire rating which is the same rating as steel and concrete. It has the highest 25 plus year rating for resistance to rot, decay and termites. Ipe is extremely hard, dense and heavy, 2 to 3 times harder than White Oak and 8 times harder than Cedar or Redwood. The wood is so dense and heavy that will not float in water. It resists wood movements such as warping, shrinking, splintering, checking and is even resistant to molds. The medium to dark brown wood does not require any treatment whatsoever as it will turn a silver gray color, but is beautiful when you apply a coat of Messmers UV Plus finish. With such outstanding attributes you could easily say Ipe is the best wood we use to build our Clarks Original Adirondack chairs. The wood is hassle free as it requires no finish, but is absolutely beautiful with a coat of UV protectant stain applied. You can maintain the beautiful rich brown color if you recoat it every 12 to 18 months. The initial cost is somewhat expensive, but much lower than Teak and a real bargain when you consider the 25 plus year durability rating. If you want an Adirondack chair that is both beautiful and as tough as they get then Ipe is a wood to seriously consider. Remember Ipe is known to last longer than 25 years, but there is not a higher rating that is given. Yes, you can honestly call it Ironwood. Mahogany is an evergreen tree of the West Indies, tropical American and Africa. The tree can reach heights of 135 feet with trunks 6 to 8 feet. According to the US Forestry wood handbook, "original mahogany wood came from the American West Indies. It was the premier wood for fine furniture and shipbuilding in Europe as early as the 1600s. Because the good reputation associated with the name mahogany is based on this wood, American Mahogany is sometimes referred to as true mahogany. A related African wood, of the genus Khaya, has long been marketed as "African Mahogany" and is used for much the same purposes as American Mahogany because of its similar properties and overall appearance". We use African Mahogany, Khaya ivorensis which is the most widely distributed and plentiful species of African Mahogany. Here are a few of the excellent characteristics of African Mahogany. The heartwood varies from pale pink to dark reddish brown. The beautiful gain is usually interlocked and the texture is medium to coarse. It is a durable wood that is resistant to rot, decay and infestation. It does not warp or shrink easily, has good nailing and screwing properties and finishes extremely well. The wood is photo sensitive and with age and exposure to light will darken into a deeper richer looking color. 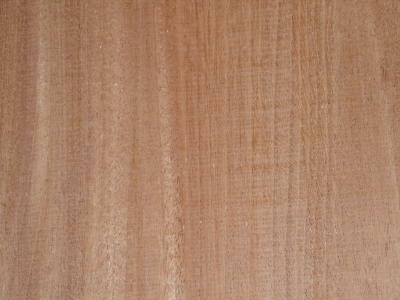 The African Mahogany wood we use is knot free and has a nice medium reddish brown color. The grain is beautiful and the texture of the wood sands to a nice finish. This is an expensive wood, but one that will last an extremely long time if properly taken care of. A very special wood that makes heavy as well as durable outdoor furniture. Accepts stains and paint well. Red Western Cedar, canoe cedar or shinglewood is found along the US Pacific coast up to Alaska, Idaho, Montana as well as Canada. The state of Washington is the big producer of the wood. Red Western Cedar heartwood is naturally resistant to deterioration from UV sunlight, insects and moisture. The wood is lightweight, moderately soft, has low strength when used as beams and is low in shock resistance. The wood has a straight variable grain pattern and the texture is coarse. The wood is not very dense and is prone to splintering and tear out. It stains well and has pretty color. To prevent splintering and end tearout pre-drilling is recommended. How about appearance? The white sapwood of the tree is very narrow and very little is seen in the lumber. The large heartwood is reddish brown. We use the moderately priced number 2 grade for our Adirondack furniture. It has good color and knots typical of Pine boards. It makes more sense to work around any large knots than to use the very costly number one grade. The color, texture and resistance of the two grades are the same. Why Red Western Cedar ? The cost is moderate, but it is long lasting with proper care. The wood is lightweight, requires no finish as it will a rustic silver gray as it weathers. You can stain it every 12 to 18 months to maintain the natural brown color. Makes durable rustic looking furniture that will withstand the outdoors for many years. Treated Pine is widely used for building outdoor projects. The wood has been chemically preserved to protect it from moisture, insects, rot and decay. The treated wood industry estimates it will last 20 to 30 times longer than untreated wood in outdoor environments. This means a treated wood outdoor project should be around a long time saving you money and conserving trees. 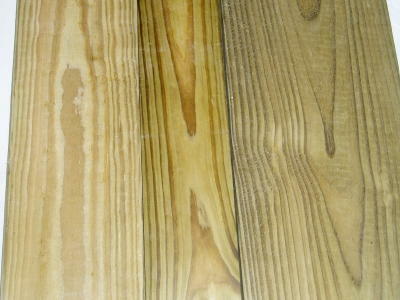 The treatment industry has long been using Southern Pine as the preferred wood for treatment. It represents nearly 85% of treated wood. There are two reasons why it is the preferred wood for treatment. Number one, the unique cellular structure of Southern Pine permits tightly held deep uniform penetration of the preserving chemicals. This is the reason the wood stays protected for so long. Number two, the wood ranks among the strongest, most versatile woods for structural applications. The industry has welcomed a new generation of preserving chemicals. This was in response to changing market perceptions and consumers interest in alternative preservatives. They no longer use Arsenic as a chemical to treat wood in the consumer and residential market. There will be no more Chromated Copper Arsenic (CCA) wood or Ammoniacal Copper Zinc Arsenic (ACZA) wood produced. The new preserving method uses an Arsenic free formulation called Alkaline Copper Quaternary (ACQ). The ACQ technology eliminates the chemical components of Arsenic and Chromium. However, with the changeover came a price increase, but lower chemical retention levels than the old Arsenic treated wood. Here is a quick account of what we found with the new ACQ wood. To begin, the boards are rated for above ground use and ground contact use. The boards for above ground use are given a chemical retention level of .25 per cubic foot (pcf). The ground contact boards are given a .40 pcf. The higher the pcf number the more the wood is protected. The only boards that are marked for ground contact are 4x4 and 6x6 post boards. Remember, these boards are intended to be buried in the ground. How will above ground .25 pcf boards do with ground contact? The industry feels that the .25 pcf level is enough to fully protect an above ground board. We trust the industry experts and use the premium choice above ground .25 pcf boards to build our Tremont Classic Adirondack chair. Why Treated Yellow Pine ? Treated Southern Yellow Pine makes outdoor furniture strong, affordable and lasting. Arsenic is no longer in the wood and chemical retention levels are lower. All the old treated wood had a .40 rating, but even with the new ACQ wood having a lower rating than the old do not think it will not last. The new wood will most likely out live its welcome or us, which ever comes first who knows. You can make it last as long as you want by deciding where and how the furniture is used along with practicing proper care. The life of wood exposed outdoors is influenced by two different conditions weathering and decay. Weathering is wood erosion by the sun, wind, debris and by moisture. Decay or rot is caused by fungi organisms that attack and deteriorate unprotected wood that is excessively moist for extended periods of time. Fortunately, there are things under your control that will slow down this process. The type of wood you select, where you choose to use it and how you choose to protect it will go a long way in determining how long it will last. Study the chart below and determine the wood deterioration zone for where you live. For example, if you are located in either the severe or high deterioration zones and plan on putting your Adirondack chairs and furniture in the worst possible conditions then you should consider selecting a wood like Ipe. It will easily last you ten plus years with very little care where as other durable woods will have some ability to last you a few years, but you will need to give them a whole lot of TLC. So when selecting a wood be sure to take into consideration how much effort and time you plan on devoting towards protecting your investment the way you should according to where you live, where you plan on putting it and how you plan on taking care of it. All of our woods are durable and each will give you many years of service. They each have pros and cons and it depends on what is the most important attribute to you when choosing a wood for your chair. Never hesitate to call us at our shop and we will gladly help you hash out what is best for you. You have made your decision about the wood type and you have a pretty good idea of where you will use your furniture. Now we can look into how to best protect your investment. To start with, you can expect some changes in your wooden furniture over time no matter what you do to protect it from the outdoors. Without any type of protection a durable wood will turn a gray color, get some surface cracks, may warp or cup a little and the surface will be rougher. This is normal and many people refer to this weathering process as "character". However, you can slow mother nature down if you want to. Before your furniture ever goes outside use a protective stain on it or paint it. This does take time, but it is easy and well worth it. Lastly, move your furniture to a protected area for the winter or when you will be away or cover it with some quality covers. Remember by doing nothing to protect wood in a high deterioration zone or under extreme conditions your furniture will change appearance and you will shorten its useful life. We use Messmer's UV Plus® "Natural", a deep penetrating alkyd-oil/urethane exterior transparent wood stain. It is a high quality product made in the U.S.A. by a family owned company located in West Jordan, Utah. The alkyd-oil based UV Plus deeply penetrates to strengthen and condition wood while maintaining a completely natural appearance. It provides excellent long lasting water repellency as well as resistance against mildew and algae growth. The high concentrations of transoxide pigments protect wood from damaging UV rays while the concentration of natural oils condition and enhance the wood. Regular use will retard wood warping, shrinking and cracking. How Long Before Another Application Is Needed? Expect the first application on a new unfinished durable wood to last 12 months or less, how long will depend on the weather exposure and type of wood as they vary dramatically in the amount of sealant they can absorb. However, expect your next application to last longer as the wood has now given mother nature back some of the natural elements that tended to keep the first application of sealant from pentrating as deeply. This is why we do not offer staining for Treated Pine because you need to give the excess mositure from the treatment process time to evaporate before sealing. Remember this is a process, and it is worth the time and effort as your furniture will age beautifully. It is as easy polishing your furniture indoors just wipe it on with a rag.